22 • RV PRO • September 2018 rv-pro.com R V M A N U F A C T U R E R S easy to tow and easy to use. The Cub is retailing well and has helped boost Kodiak's market share this year, according to James. Dutchmen also will be showcasing new models and features in the Aspen Trail product, which will include a new single-axle lightweight model as well as an all-new double slide rear living room model. 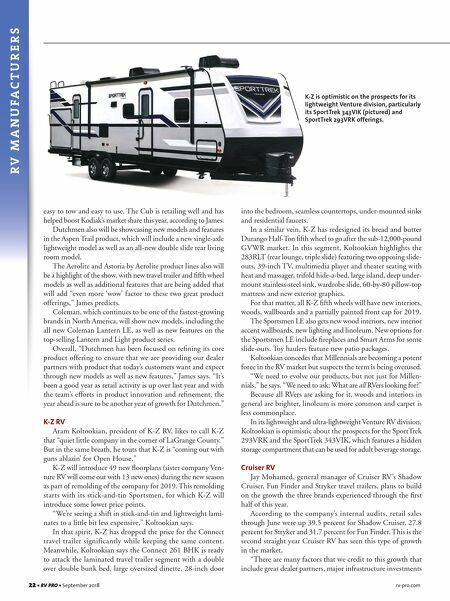 The Aerolite and Astoria by Aerolite product lines also will be a highlight of the show, with new travel trailer and fifth wheel models as well as additional features that are being added that will add "even more 'wow' factor to these two great product offerings," James predicts. Coleman, which continues to be one of the fastest-growing brands in North America, will show new models, including the all new Coleman Lantern LE, as well as new features on the top-selling Lantern and Light product series. Overall, "Dutchmen has been focused on refining its core product offering to ensure that we are providing our dealer partners with product that today's customers want and expect through new models as well as new features," James says. "It's been a good year as retail activity is up over last year and with the team's efforts in product innovation and refinement, the year ahead is sure to be another year of growth for Dutchmen." K-Z RV Aram Koltookian, president of K-Z RV, likes to call K-Z that "quiet little company in the corner of LaGrange County." But in the same breath, he touts that K-Z is "coming out with guns ablazin' for Open House." K-Z will introduce 49 new floorplans (sister company Ven- ture RV will come out with 13 new ones) during the new season as part of remolding of the company for 2019. This remolding starts with its stick-and-tin Sportsmen, for which K-Z will introduce some lower price points. "We're seeing a shift in stick-and-tin and lightweight lami- nates to a little bit less expensive," Koltookian says. In that spirit, K-Z has dropped the price for the Connect travel trailer significantly while keeping the same content. Meanwhile, Koltookian says the Connect 261 BHK is ready to attack the laminated travel trailer segment with a double over double bunk bed, large oversized dinette, 28-inch door into the bedroom, seamless countertops, under-mounted sinks and residential faucets. In a similar vein, K-Z has redesigned its bread and butter Durango Half-Ton fifth wheel to go after the sub-12,000-pound GVWR market. In this segment, Koltookian highlights the 283RLT (rear lounge, triple slide) featuring two opposing slide- outs, 39-inch TV, multimedia player and theater seating with heat and massager, trifold hide-a-bed, large island, deep under- mount stainless-steel sink, wardrobe slide, 60-by-80 pillow-top mattress and new exterior graphics. For that matter, all K-Z fifth wheels will have new interiors, woods, wallboards and a partially painted front cap for 2019. The Sportsmen LE also gets new wood interiors, new interior accent wallboards, new lighting and linoleum. New options for the Sportsmen LE include fireplaces and Smart Arms for some slide-outs. Toy haulers feature new patio packages. Koltookian concedes that Millennials are becoming a potent force in the RV market but suspects the term is being overused. "We need to evolve our products, but not just for Millen- nials," he says. "We need to ask: What are all RVers looking for?" Because all RVers are asking for it, woods and interiors in general are brighter, linoleum is more common and carpet is less commonplace. In its lightweight and ultra-lightweight Venture RV division, Koltookian is optimistic about the prospects for the SportTrek 293VRK and the SportTrek 343VIK, which features a hidden storage compartment that can be used for adult beverage storage. 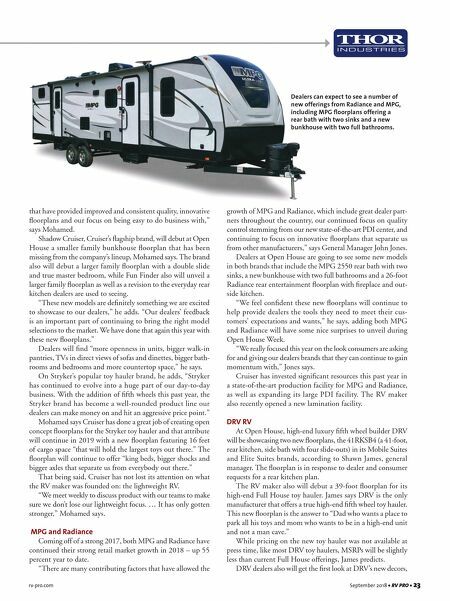 Cruiser RV Jay Mohamed, general manager of Cruiser RV's Shadow Cruiser, Fun Finder and Stryker travel trailers, plans to build on the growth the three brands experienced through the first half of this year. According to the company's internal audits, retail sales through June were up 39.5 percent for Shadow Cruiser, 27.8 percent for Stryker and 31.7 percent for Fun Finder. This is the second straight year Cruiser RV has seen this type of growth in the market. "There are many factors that we credit to this growth that include great dealer partners, major infrastructure investments K-Z is optimistic on the prospects for its lightweight Venture division, particularly its SportTrek 343VIK (pictured) and SportTrek 293VRK offerings.